Look at this chap, he is a Simon & Halbig for Kaemmer & Reinhardt doll which is wonderful condition. Dressed in his original highland outfit with his tartan kilt and sporan. 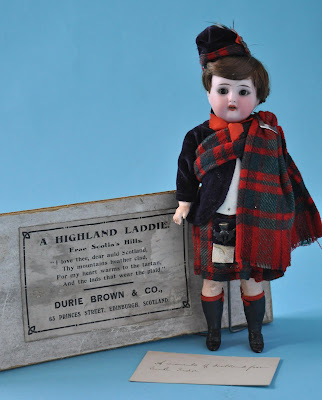 The best thing about the doll is his original box, he was a souvenir from Edinburgh. I am sure you can buy the modern version of this today, but it would probably be plastic and poorly made. The label on the box is for the shop Durie Brown & Co, 63 Princes Street, Edinburgh. He dates from around 1910. Another charming part of this item is a little card that was included in the box, it was inscribed `A memento of Scotland from Uncle Tudor'. Sadly who it was given to and also who Uncle Tudor was, has been lost forever, but what a lovely thing. I sold this doll in my auction in November 2009, I will be doing another auction in November 2010. If you want to find out more, visit my website (the link is above, right)and join my mailing list.